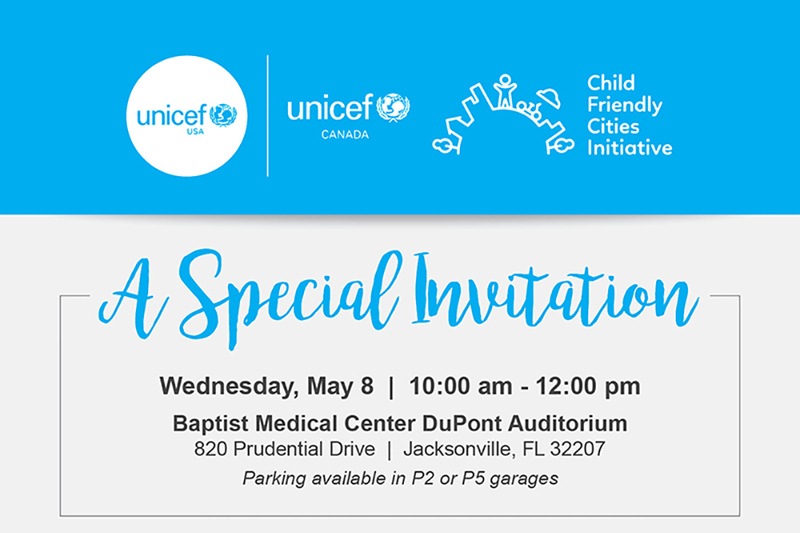 On behalf of UNICEF and our community hosts and sponsors, we invite you to join other senior executives from Jacksonville's medical, foundation, advocacy and academic institutions to leam how to transform Jacksonville into a Child-Friendly City (CFC). A summary of the CFC Expert Group Meeting held on May 6-7 will be presented. Future strategies for child rights-based policies and programs to help all children reach their full potential will be explored. Please feel free to invite other senior executives who might be interested in leaming more about child-friendly cities. For map to P5 parking garage click here. For Google map click here. Please register your attendance by Friday, May 3.